Did the working class see this coming at all? This post originally appeared at Economic Policy Institute. During his campaign, President-elect Donald Trump promised that he would take the side of American workers against economic elites when evaluating policy. Yet the policy proposals he put forth during the campaign had nothing in them that would actually help working — and middle-class Americans. Now that more plans and potential Cabinet appointments are coming into focus, it looks worse than many of us thought even before the election. Across a broad range of crucial issues, the incoming Trump administration appears likely to betray the promises he made to the American middle class. Here’s a rough sketch of how. People really can’t claim they didn’t see this coming. Trump’s tax policy proposals are crystal clear about who will benefit the most — and it’s not working- or middle-class families. Despite crowing during the campaign about raising taxes on “hedge fund guys,” the tax plan Trump released raises one small tax on hedge fund guys (eliminating the so-called carried interest loophole), and then gives them a hundred times more back in the form of lower taxes everywhere else. The top 1 percent will get 47 percent of the total benefits in the Trump tax plan, while the bottom 60 percent will get just 10 percent. Worse, large numbers of working-class taxpayers will see tax increases under Trump. Yes, increases. Because that money is needed to make sure that private equity managers can see their top tax rates moved down to 15 percent. House Speaker Paul Ryan — who many (not least Speaker Ryan himself) think will end up crafting most of the actual policy to come out of the Trump administration — has a competing tax proposal. Apparently, he thinks it’s important to give an even higher share of tax cuts to the top. The Ryan plan lavishes 76 percent of its total tax benefits onto the top 1 percent of households (the top 0.1 percent, or the top 1/1000th of households, gets more than 47 percent). In the Ryan plan, the bottom 60 percent get less than 5 percent of the total benefits. A very large tax cut that delivers an enormous share of the benefits to the richest Americans — with an average cut of at least $1,100,000 to the richest 0.1 percent — will be one of the top priorities of both Trump and the incoming Congress. This should raise a clear red flag about just how much Trump actually cares about the bottom 90 percent. People really can’t claim they didn’t see this coming. In the town hall debate with Hillary Clinton, an audience member asked how the candidates would ensure that the richest Americans paid their fair share. Trump’s response? He said he would cut the corporate income tax rate from 35 to 15 percent. Given that the corporate income tax is one of the most progressive parts of our tax code, cutting it absolutely does not hurt rich households. Trump has also promised to end crony capitalism and ‘drain the swamp,’ which might sound to most Americans like he wants to take on Wall Street. If by ‘take on’ you mean ‘give them everything they want,’ then this sounds about right. Trump has also promised to end crony capitalism and “drain the swamp,” which might sound to most Americans like he wants to take on Wall Street. If by “take on” you mean “give them everything they want,” then this sounds about right. He has been forthright about repealing Dodd-Frank, which as passed in the wake of the 2008 financial crisis to rein in the risk of big banks and prevent the need for future bailouts. There are criticisms to be made of Dodd-Frank, but the Trump criticism is that it’s just too tough on banks. This view is shared by the men mentioned as potential Treasury secretaries in the Trump administration. One name is Jamie Dimon, whose investment bank JPMorgan Chase received a 2008 bailout. In recent years JPMorgan traders have been found guilty of rigging foreign exchange markets. And yet Dimon claims that “banks are under assault” by regulators and that such oversight is essentially un-American. Another name that’s been floated for Treasury secretary is Anthony Scaramucci, who thinks that there has been an “irrational demonization of Wall Street over the past eight years,” and that Wall Street is “filled with integrity.” As for the financial crash of 2008, Scaramucci is clear who is to blame — mostly not Wall Street. The culprit who needs more blame cast upon them, he says, is “frankly, Main Street. Many people overreached in their homes because there was easy money and easy credit.” He hopes the “nonsense” that Wall Street bears primary responsibility for the 2008 financial crash ends with the Trump administration. And he makes it clear that his personal opinion is that Dodd-Frank restricts banking risk excessively (making banking “too, too safe”) and should be repealed. Finally, the frontrunner for Treasury seems to be Steve Mnuchin, a Goldman Sachs alum who distinguished himself during the financial crash by buying up the crashed California bank IndyMac, renaming it, and then being found by regulators to have run “unsafe” and “unsound” foreclosure practices as he seized people’s homes. If you want an administration where apologists for Wall Street behavior are in charge of regulating banks, then the next four years looks great. If you were hoping for an administration that would be on your side against the banks, then less so. And if you doubt my analysis of how Wall Street-friendly a Trump administration is likely to be, just check out the reaction of banks’ stock prices following the Trump win. Americans value Medicare and Medicaid very highly, and rightly so. Millions rely on these programs for health care during tough times (Medicaid) and in retirement (Medicare), and about 40 percent of long-term care in the country is provided by Medicaid. During the campaign, Trump made clear promises to protect these programs from budget cuts. The question going forward, however, is did we elect President Donald Trump or President Paul Ryan? Ryan has wanted to voucherize Medicare and radically cut Medicaid for years. He tries to dress up his plans in technocratic language and frame them as “reforms,” but, they’re cuts, period. One would think that the more than 60 times the House has voted to repeal the Medicaid expansions that are part of the Affordable Care Act would provide sufficient proof of this. During the campaign, Trump made clear promises to protect these programs from budget cuts. The question going forward, however, is did we elect President Donald Trump or President Paul Ryan? It may be that Trump really does not want to cut these programs. But the question is whether or not he’s attentive and shrewd enough to stop congressional Republicans from doing so. The president-elect recently claimed (through a tweet, of course) that he personally convinced Ford to keep one of its production facilities in the United States. This boast has been debunked. But compared to the rest of his trade policy, the efficacy of picking up the phone and calling his CEO friends actually doesn’t look so bad. We at EPI have been consistent for years in opposing corporate-driven trade agreements. But Trump’s agenda on trade agreements is nothing more than a vague claim he’ll be able to negotiate “better” trade agreements. His other proposals indicate strongly that he won’t, because he doesn’t know how. He might slap large, arbitrary tariffs on imports from countries he doesn’t seem to much like, but this will do little to improve American competitiveness. In fact, if such tariffs encourage foreign producers to set up facilities in the United States to avoid tariffs, create economic weakness in our trading partners, and/or encourage retaliatory tariffs, they will increase America’s trade deficit. A prediction: presuming the economy does not enter recession in the next four years (and there’s no reason it should, absent a huge fumble by the Trump policymaking team), the American trade deficit will be larger, not smaller, by 2020. Finally, I should note that Trump is once again in his life inheriting an extraordinarily valuable gift. This time it’s a stable economy that has been sailing steadily towards full employment for years. The unemployment rate has been halved since its post-Great Recession peak. The labor force participation rate stopped falling and has actually nudged up in the past year even as natural demographic changes (retiring Baby Boomers) have been pulling it down. 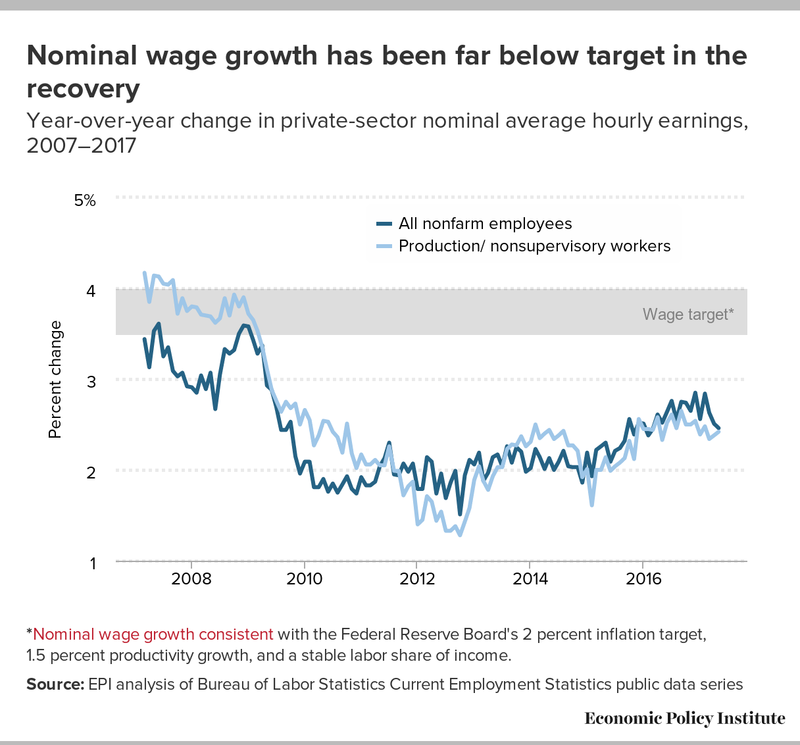 The last year has also seen some evidence of an uptick in wage growth. No, we’re not at full employment today — largely because Republicans in Congress and in statehouses around the country have starved the economy of normal levels of spending during the recovery. Without this austerity, we would have reached full employment years ago. But even with no help at all from tax cuts or spending increases, the economy is projected to reach 4.6 percent unemployment or lower by the end of 2017. And now that Republicans are in charge, the austerity they forced on the American people will undoubtedly stop. A huge tax cut will add to purchasing power and demand growth in the economy. It will do so incredibly inefficiently, creating about 1 job for every 4 that could be created if this money was spent more intelligently. But job creation has to take a back seat as a goal to maximizing the take of the top 1 percent, so, tax cuts for rich households it is. Inefficient stimulus, but lots of it. A possible infrastructure plan would also boost growth, so long as its effectiveness was not compromised by the crony capitalism and poor targeting that would result from the Trump proposal’s very odd structure of giving tax credits to private investors, rather than just having state and local governments direct and finance projects. For those hoping that the Trump infrastructure plan would be aimed at helping struggling areas, it is worth noting that a key source of efficiency gains hoped for by the plan’s authors is that private investors are much more willing to cut off necessary services to households in economic distress. They approvingly note that privately-owned water and electrical utilities are much quicker and more willing to turn off services when households cannot pay bills than publicly owned utilities. All in all, the hopes that a Trump administration will stand up to elites on behalf of the broad middle class look well on their way to being dashed. Republicans first priority is cutting $1.1 million tax rebate checks to the top 0.1 percent. A secondary priority is giving away tax credits to private developers while hoping that they might build something useful without the whole endeavor becoming a nest of corruption. A key question is whether or not Trump will be willing to devote the energy and effort needed to stand behind his own words about defending Medicare and Medicaid in the face of the Republican Congress. Their trade plans are pure bluster and as likely to raise as lower the trade deficit. And every single potential appointment floated to run the regulation of banks and Wall Street is on record as arguing that the big problem today is that people and governments are too mean to virtuous financial professionals. Maybe I’m wrong (I sure hope so), but the wedge between implied promises and delivered reality to working-class households already looks awfully large, and will likely just grow over time. Josh Bivens is the research and policy director at the Economic Policy Institute (EPI). His areas of research include macroeconomics, fiscal and monetary policy, the economics of globalization, social insurance and public investment. He frequently appears as an economics expert on news shows, including the PBS NewsHour, the Melissa Harris-Perry show on MSNBC, WAMU’s The Diane Rehm Show, American Public Media’s Marketplace and programs of the BBC. Follow him on Twitter: @joshbivens_DC.